Everything you’ve ever wanted to know about this iconic lady. That depends on how you measure it! The height of the Statue of Liberty is 151 ft. from the base to the torch. With the pedestal and foundation included in the measurement, the full height is 305 ft.
Miss Liberty sits proudly atop the 65 ft. tall foundation fashioned in the shape of an eleven-point star, and an 89 ft. stone pedestal. Wow! That lady’s got big feet! It’s true, Miss Liberty’s feet are 25 ft long, making her a US women’s shoe size 879. She also has a 35 ft. waist, and her face is more than 8 ft. tall. Her right arm, which holds the ever-lit torch, measures 42 ft.
And I thought I had a big nose! 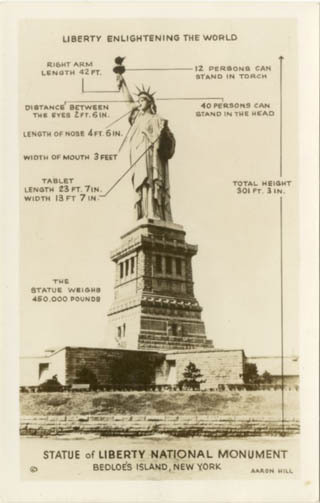 The Statue of Liberty’s nose is 4 ft. 6 in. There are 354 steps inside the statue from the pedestal to the crown, which was open to visitors prior to September 11, 2001. The crown, with its 25 window-view of New York Harbor, will reopen to the public on July 4, 2009. In 2004, public access was granted to the observation deck and museum gallery, but the rest of the interior has remained closed. The crown has seven points, representing the seven seas and seven continents. Each individual ray of the crown weighs about 150 pounds, and measures up to 9 ft. The total weight of the Statue of Liberty is 450,000 pounds (225 tons). The copper alone weighs around 100 U.S. tons and is 3⁄32 of an inch thick—a little less than the thickness of two pennies. It was hammered by hand into plates, which are attached to the interior iron frame. This early video of the Statue of Liberty, filmed in 1898, was filmed by the Edison Film Manufacturing Company.